Marcenia “Toni Stone” Lyle, Ila Borders, and most recently, Eri Yoshida of Japan, are among the very few truly accomplished female baseball players who found spots on the rosters of professional male teams. In 1993, Carey Schueler—the daughter of then White Sox general manager Ron Schueler—was drafted by the White Sox, becoming at 18 years old the first woman ever drafted by a Major League team. Schueler, a left-handed pitcher, never took the field for a game. 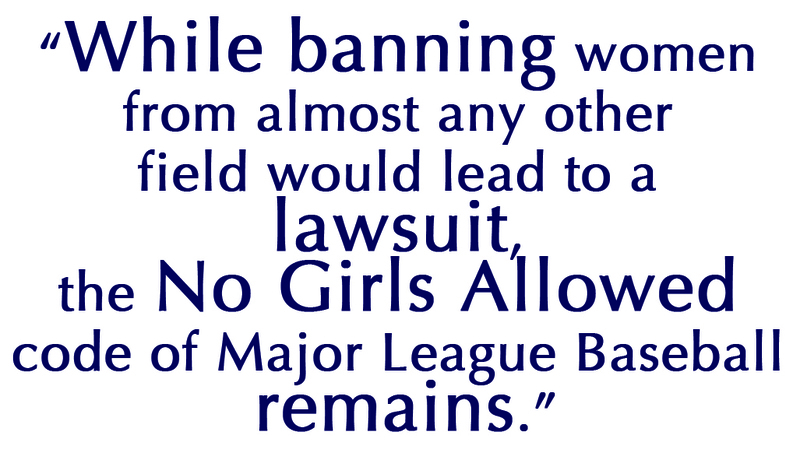 While banning women from almost any other field would lead to a lawsuit, the No Girls Allowed code of Major League Baseball remains. Is it because women are too delicate for the physical challenges of MLB, or because they don’t have the physical ability or talent? Some women, perhaps. But not all, as evidenced by Mitchell, Lyle, Borders, Yoshida, and a fresh generation of skilled female Little Leaguers. The same physical limitations used to justify banning women from professional baseball can also be applied to most male players—they aren’t strong enough, they aren’t fast enough, they aren’t good enough. Some female athletes are strong enough. And fast enough and good enough. Yet they still don’t have the same opportunities their male contemporaries enjoy. Male athletes who play baseball well have the chance to earn scholarships to college and perhaps even play professionally. Female athletes deserve the same. No capable athlete should be banned from the Major Leagues because of her gender. Diamonds are a girl’s best friend. It’s long past time we redefined that saying. Crystal Hubbard is a sports buff and full-time writer. Her books include Catching the Moon: The Story of a Young Girl’s Baseball Dream, Game, Set, Match, Champion Arthur Ashe, and The Last Black King of the Kentucky Derby. Previous PostSpring into Multicultural Children’s Books!Next PostWhat does Passover celebrate? Thanks for sharing this information. There should be an equal treatment for men and boys.